Gallows to part company with lead singer Frank Carter - last few live dates until August 2011! Gallows and lead singer Frank Carter have today issued a joint statement about their intentions to go their separate ways in August. The band, formed in Watford in 2005 and singer Frank Carter will part company as of 1st August - once their tour and festival commitments are out of the way. It is with a heavy heart that I have to announce my departure from Gallows. It seems that Gallows have hit a crossroads in our writing process and unfortunately myself and the rest of the boys have different ideas regarding the sound of Gallows going forward. 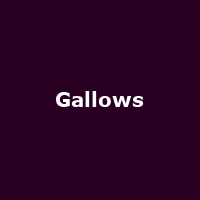 Gallows have decided they are going to continue on without me and I wish the boys the best of luck for the future. Gallows will be fulfilling all of our current touring plans until August 1st so please come down to a show and help me make each show a total celebration! We realise Frank is a hard figure to replace so be assured that the decision to continue as a band has been one we've been deliberating over long and hard. We're extremely confident that we won't be letting anyone down when we drop the next record, especially not ourselves or the people who believe in us. Death is birth. Your ears have been warned. The band are currently in the midst of a headline tour, so for you last chance to see Frank at the helm, check the listings, below. A new ULU London will go on sale on Tuesday at 9AM, costing £15. Expect demand to be massive!